Channel your inner Jacques Cousteau aboard the Royal Delfin, a modern catamaran with spectacular underwater views. 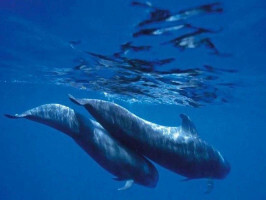 During the trip you will have the opportunity to see whales, dolphins and many other species that inhabit the waters of Tenerife. Enjoy an unforgettable and unrepeatable experience! Enjoy a relaxing cruise aboard the Royal Delfin in the western coast of Tenerife as you sit back and enjoy the peaceful sea and the fascinating scenery all around you. 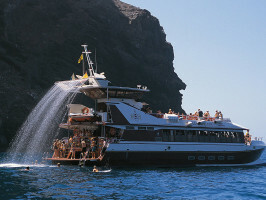 Specialising in whale watching in the wild, the Royal Delfin is a modern glass bottom catamaran equipped with 10 underwater television cameras and six screens, streaming live images to the monitors up on the main deck, so that you can come face to face with dolphins, whales and other denizens of the deep. During a break in the voyage, enjoy a refreshing dip in the crystal-clear waters while lunch is served on board with drinks included. Expert guides will accompany you on the trip, providing a fascinating commentary in several languages. The return trip will give you the chance to enjoy a different view of this spectacular coast with its sophisticated resorts, volcanic beaches, hidden coves and wide bays sailing down to Puerto Colon, where the journey will come to an end. An unforgettable day out for all the family! Please note that the 2-hour tour does not include food or a swimming break. 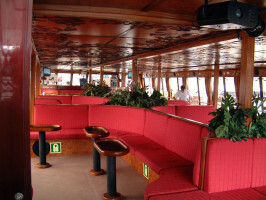 2 hour cruise: Monday and Thursday at 10:30am. 3 hour cruise: Wednesday at 10:30am and Saturday at 2pm. 4.5 hour cruise: (low season from November to June) Tuesday, Friday and Saturday at 9:30am; Monday, Wednesday and Thursday at 2pm; (high season from July to October) Tuesday, Friday and Saturday at 9:30am, and daily at 2pm. There are trips of two, three and four-and-a-half hours. German, French, Italien, Spanish, English and Dutch. Duration: 2 , 3 or 4 hours and half .